This area is for inquiries regarding booking events/parties for 20 guests or more only. For any other inquiries, please call Ocean deck at 386-253-5224. We have several options to impress your guests for any occasion. order from Our Regular Menu. 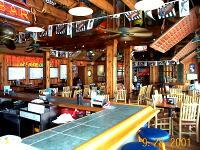 Ordering off our regular menu is available at Ocean Deck and is suggested for any size party. Please see our regular menu in the “Menu” section. Our Buffet Menu is available November thru December only! By selecting buffet dining for parties of 50 or more, you can ensure all necessary preparations have been made by our kitchen and our wait staff for your party’s success. Our Specialty Dinner Menu allows you to choose from a set menu selection and includes table service. We have six preset specialty dinners to choose from. This is a great option for larger parties. We also offer a Set menu option. You may choose items from our regular menu designed to give your guests a variety of tastes while limiting choices. This is a great way to stay within a budget and still enjoy the comforts of table service. Please fill in the form below to contact our party planner. Please note: this is NOT a reservation form. This is for large parties and events. Beer, Wine, and Desserts also available! Sides: Garlic mashed red-skinned potatoes and vegetable medley. Appetizer: Each table of 4 receives a bowl of Rasta Fish Dip with tortilla chips. Choice of Entree: Mahi Mahi Dinner: delicious filet, lightly seasoned and grilled to perfection, Rasta Chicken: grilled tender breast meat marinated in our World Famous Rasta Sauce, or Top Sirloin: center-cut steak, lightly seasoned and char-grilled. Sides: Rice and vegetable medley. Sides: Garlic mashed red-skinned potatoes and Fresh vegetables and a dinner roll. Roast Beef: USDA choice roast beef simmered in au jus sauce to a medium rare and thinly sliced. Sides: Steamed vegetable medley, garlic mashed red-skinned potatoes, dinner rolls and Caesar or Garden salad. Roast Beef: USDA choice roast beef simmered in au jus to a medium rare and thinly sliced. Honey Baked Ham: Our very appetizing honey baked ham will surely have your guests feeling like Mom just made her home cooked dinner. Thick-sliced and cooked to perfection. Garlic Shrimp Scampi: Gulf shrimp sautéed in garlic butter served over pasta. Rasta Chicken: Grilled, tender breast meat marinated in our very own “spicy” Rasta Sauce. Sides: Rice, vegetable medley, garlic mashed red-skinned potatoes, Garden Salad, Fresh Fruit and dinner rolls. Fried Shrimp: Plump Shrimp begging to be dipped in cocktail sauce. Gulf Shrimp: Peel-and-Eat Shrimp steamed or chilled over ice. Cajun Fish Tacos: Seasoned Fish Filets on a flour tortilla covered with lettuce, tomatoes, shredded cheese, and fresh Mango Salsa. Sides: Steamed Vegetable Medley, Garlic Mashed Potatoes, dinner rolls, and a Garden or Caesar Salad. Pre-purchased at $6.00 per ticket to be issued to your guests in exchange for a cocktail or beer. Tickets are valid only during scheduled party. Purchase a bottle of wine or champagne to be opened at each table. We recommend 1 bottle for every 4 guests. Select the type of beer you would like to have chilled in ice-filled buckets. Buckets hold 16oz. beers or 12oz. beers. 1 bucket of beer is recommended for every 2 guests. Price ranges vary depending on brand of beer. Pineapple, orange and grapefruit juices with grenadine spiked with a blend of Island rums. Based on your guests consumption. Well brand liquors, beer, and house wines by the glass. Call brand liquors, well liquors, beer, house and call wines by the glass. The Upper Deck: Enjoy our air conditioned dinning room with lot’s of tables and big screen TV’s so you can catch all the games. 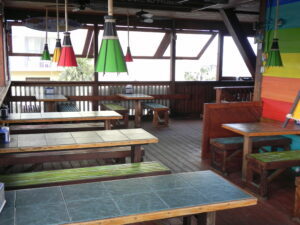 Located on the second-level, you get a great view of the Atlantic Ocean and the seagull’s perspective of Daytona Beach. There’s nothing like our great seafood and sandwiches. Our diverse menu will satisfy every diner’s palate. Our Rasta Chicken and Mahi-Mahi Sandwiches are local favorites. As is The Ocean Decker, a burger topped with ham, bacon, cheese, onion rings and more. You won’t believe your eyes! The West Deck: You’ll love our OPEN AIR deck! Feel the cool beach breezes while you enjoy the best seafood in town. You can even watch a beautiful sunset! This deck is great for when you want to throw a private party for you and your friends. With 60 seats this area is great for special occasions.